Steve Ballmer: Apple Pay was an "obvious idea"
The former CEO of Microsoft, Steve Ballmer, gives Apple credit for pulling off its mobile payment system -- but not too much credit. In a conversation with CBS News' Jeff Glor on Tuesday, Ballmer allowed that Apple has done "what seems like a reasonable job" on the technology of Apple Pay, which launched on Monday. The potential for success, however, he said is due not to Apple's ingenuity, but to its economy of scale. "They're the only guys, really, who have enough volume of phones to go make something like this happen." Ballmer asserted that the concept is nothing new. "It's kind of an obvious idea that you should use your phone to pay for things. That has been an obvious idea for 5 or 6 years. I'm not picking on Apple, it's an obvious idea." Google Wallet, which uses the same Near Field Communication (NFC) technology as Apple Pay, debuted on Android phones in 2011, but has struggled to gain a foothold with retailers and users. PayPal also facilitates mobile payments. Ballmer said that what gives Apple Pay an edge is having the consumer reach to get stores to sign on. 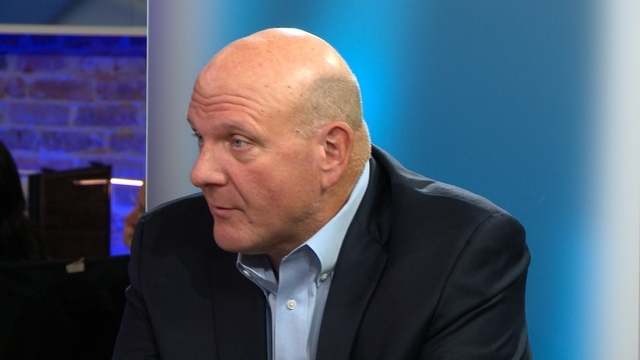 In an appearance on "CBS This Morning" earlier Tuesday, Ballmer reflected on his earliest days at Microsoft (when the company's $2.5 million in revenues were but a fraction of the $2 billion Ballmer paid in August to buy the L.A. Clippers), and commented that "in this day and age [Microsoft doesn't] have as big a mobile presence as we need to. All along the way we appreciated mobile. But we're not winning in mobile."